The beauty of the 120-acre Hastings College campus is due in part to the tradition of tree planting and care beginning with the first spring planting season in 1883 and, with the help of countless volunteers and professionals, continuing to the present. Come explore the Hastings College Arboretum, rich with old and young trees and species variety, located in the heart of the Great Plains. 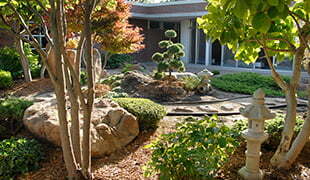 A unique feature of the Hastings College Arboretum was created in 1996 when the Japanese Friendship Garden was installed in the courtyard on the east side of Hazelrigg Student Union. The student union lobby over looks the garden, which was sponsored by the Hastings/Arapahoe/Ozu, Japan International Exchange Program. If you or a group would like a tour of the arboretum, or have suggestions, please contact Dr. Will Locke ’61, Professor Emeritus of Teacher Education, at wlocke@hastings.edu. Hastings College also offers the opportunity for individuals to place tribute trees on campus in memory of former students, parents or professors.